Is it an analysis tool, or an aggregation tool? Anyone who is involved in the web industry knows about the existence of "Google Analytics". Although I might not need to explain again, "Google Analytics" is a service that is to know the number of visits and visitors on particular website, and it is an indispensable tool for people who work in the industry, for surveying such as "popular pages" and "unpopular pages" or "investment effect of online ads". On the other hand, for many people it can be said "a too much functional tool". In order to display the information which you want to see, you must go through complicated procedures because its multifunctionality. Even those who log in to "Google Analytics" every week, to make "in-house weekly newsletter" for example, actually use only a few functions of it. Therefore, many people use "custom reports" (dashboards) and "custom alerts" (email notifications) trying to make the every time work efficient. No abnormality in aggregated value this week! The following Business Process Definition is "Website Operation Status Reporting Process" to be conducted weekly. 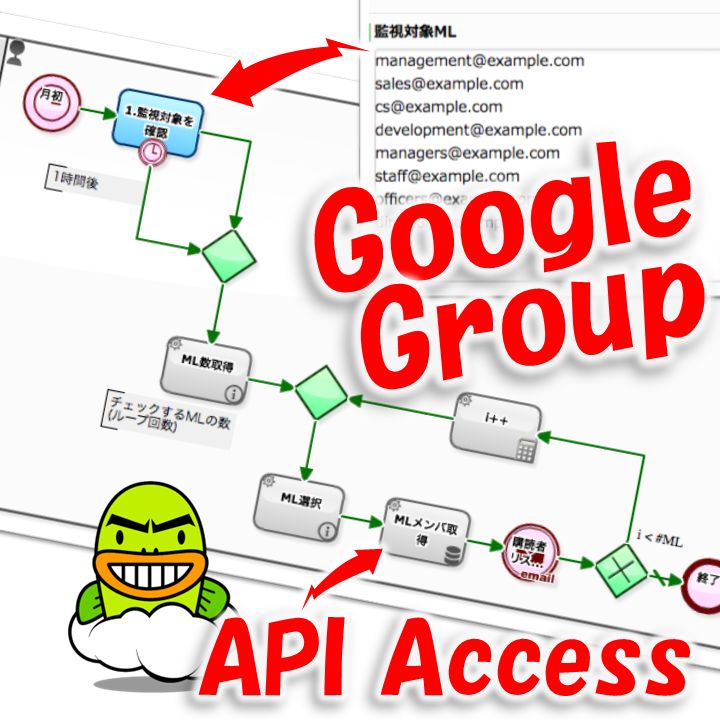 Every Monday morning, "a draft of report that aggregated data of Google Analytics has been inserted" will be prepared. Therefore, marketers can complete a report for the entire company just by entering a brief commentary. You do not need to log into "Google Analytics" unless remarkable changes occur. 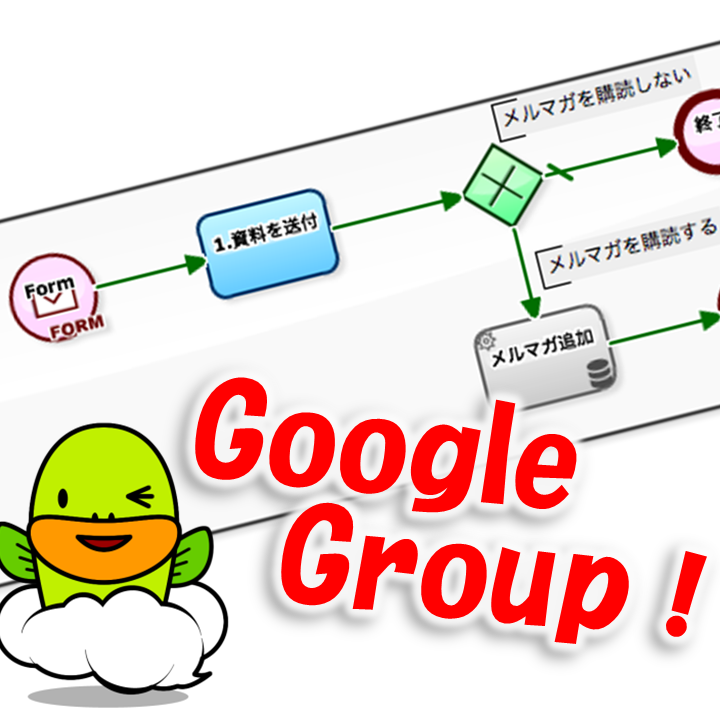 In the last article and the one before the last, I introduced you Business Process Definitions which automatized addition or deletion of members of "Google Group" to be carried out. 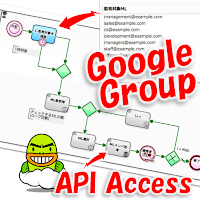 If Google Group is being used as "In-house information sharing tool" in your company, these functions such as automatic addition and automatic deletion could be very useful as "mechanism to guarantee timely update". However, even if you introduced such a mechanism, "maintaining correct members" is not easy. 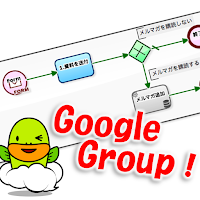 In some cases, for example, you could have added a member to a "wrong group" (system administration screen) in corresponding to a rush-request. Or, there may be cases where a user him/herself commits "unsubscribe processing" (User setting screen). Those cases are state of "Information will reach people who should not reach" or "Information does not reach the person to reach". "What? Was there such a notification?" An employee worked without receiving information via mailing list for months feeling something was strange. That kind of Tragedy (which is a very terrible thing) will always occur someday. This article has the improved version. That was a mechanism by which one email address to be added to "one mailing list" automatically. However, when you look around mailing lists inside your company, (even though it is on a downward trend due to the spread of so-called "chat tool") you will find various in-house mailing lists are used on a daily basis in many tasks, such as "Directive of the business policy", "Sharing information that should be limited within a department" and "Receiving system alerts". Therefore, regarding management of mailing lists, it might be more cases where you want to add an email address to all of the "multiple mailing lists" at once. The following Business Process Definition is "flow for new account request". If there is a "new account request" from within the company, the IT system department will make necessary system settings such as "issue new account" and "modify LDAP setting". It is used in many organizations on a daily basis, such as for "information sharing" within the organization or for "information announcement" to customers. However, there are not a few cases where "maintenance work" of the list is neglected. Such a kind of situation will be occurring all over the world. 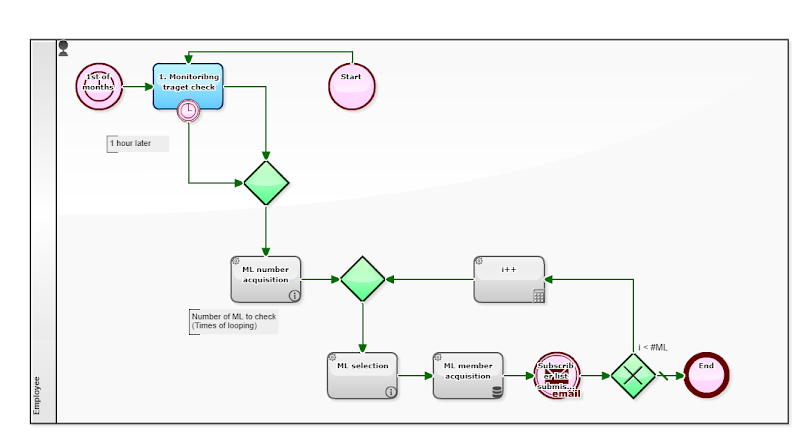 The following Business Process definition is "Information material request correspondence flow". 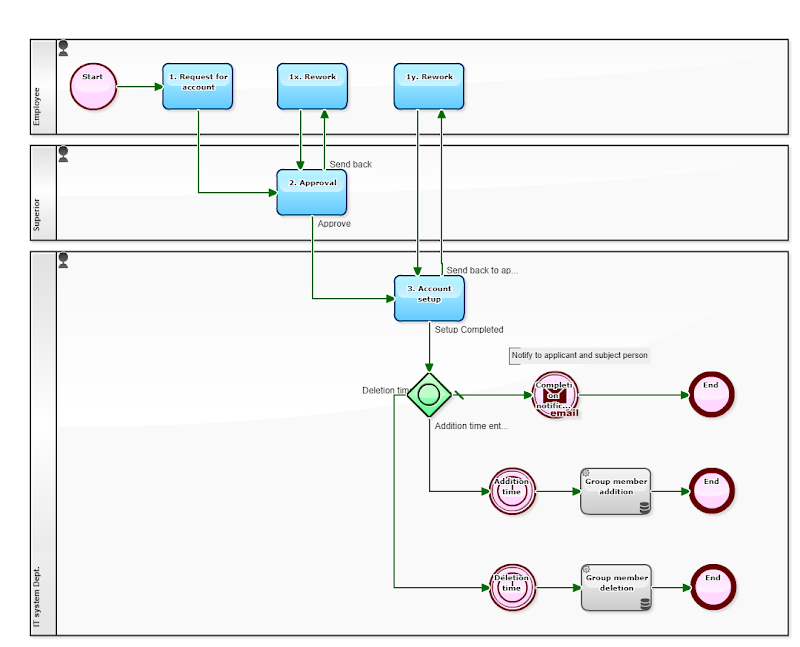 This Workflow will be initiated by request via Web by a customer. 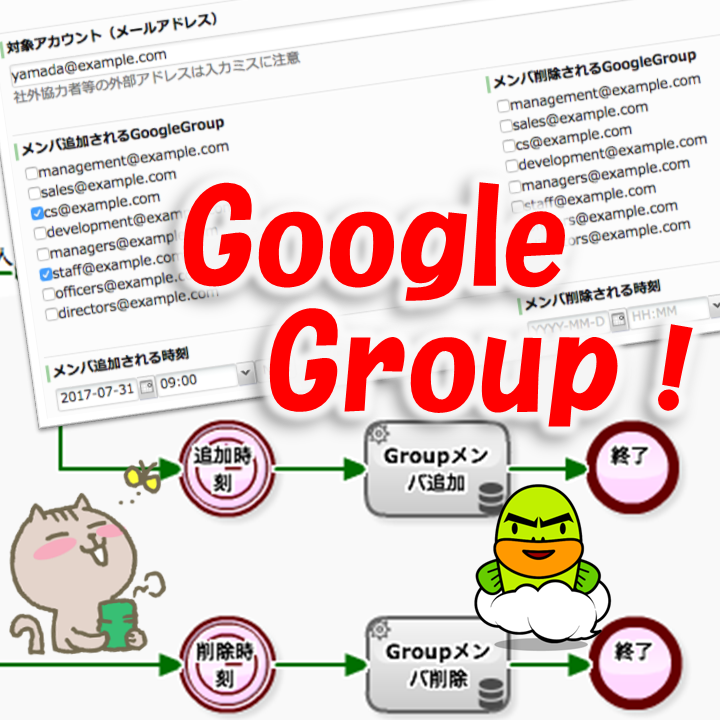 And, when the requested Issue reaches at the automatic Step "Add to Subscriber", the "customer's email address" will be automatically added to the mailing list (Google Group). Such "automatization" of processing not only eliminates the trouble of the G Suite administrator accessing the management screen to manually copy the data, but also contributes to preventing troubles due to setting mistakes and time loss. 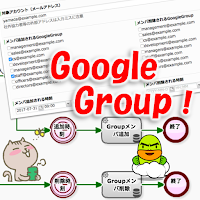 Moreover, it realizes "Address addition history record" which was difficult by manual setting. In the last article and one before the last, I introduced you a mechanism to control "PayPal billing system" from Workflow system. 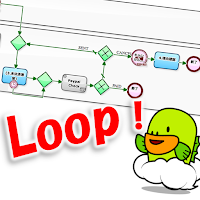 Today, not only the "payment system" (*1) as in this example, but also the operation of various information systems are automated, and the productivity is improved. For example, preservation of quotation to "Storage system" (*2), or management of product master data in "Spreadsheet / Data management system" (*3), are typical examples. *1: PayPal, Stripe, etc. *2: Dropbox, Box, Google Drive, etc. *3 Google SpreadSheet, Kintone, etc. The fact that the process owner only needs to set properties of the Addon automatic Step (programming knowledge is no longer needed) is also one of the reasons for popularization. Until which stage of situation change you should make unmanned? However, there are not only "advantages" that unmanning brings. 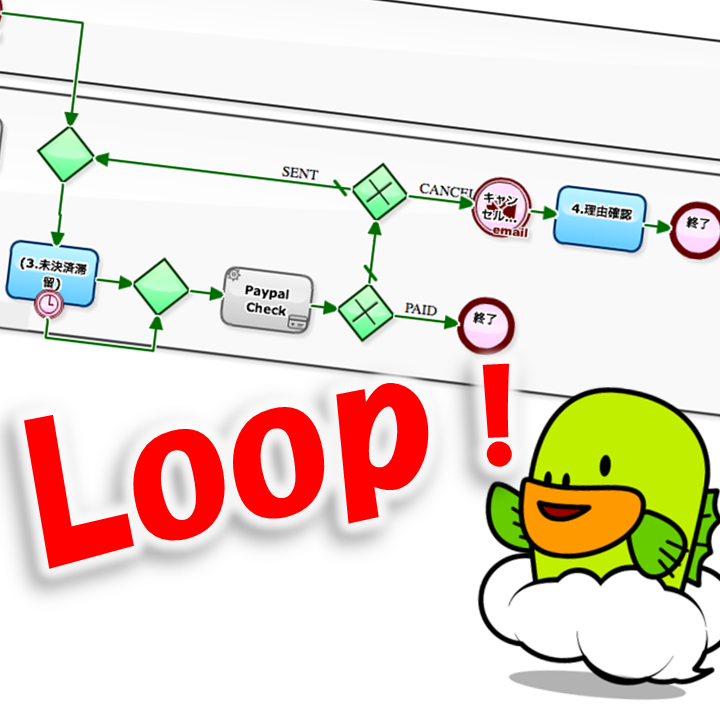 In the previous article, for example, it was a business flow that it continues confirming (keep on looping) until the status of electronic invoice turns to "PAID". It sure is, there is no human cost on "confirmation work" alone since human does not intervene. However, if an event such as "order cancellation" or "remittance with another settlement method" has occurred, it may be necessary to stop the Task of "shipping processing" in some cases. Or depending on circumstances, it may become necessary to modify the processing of "recording sales". Yet, as for the situation change which "influence degree × occurrence probability" is large, as a business process definition, I would like to make it "within the range of assumption" as much as possible, not leaving it as "unexpected". In the following business process definition, "CANCELED status" (cancellation) which is relatively frequently occurring has been taken into consideration. That is, it is added devising that alert email to be sent when payment is refused.